Halloween parties can be made more fun by giving prizes for the best costume. Such prizes hold special importance for kids. Everyone dresses up like his or her favorite character on this occasion. 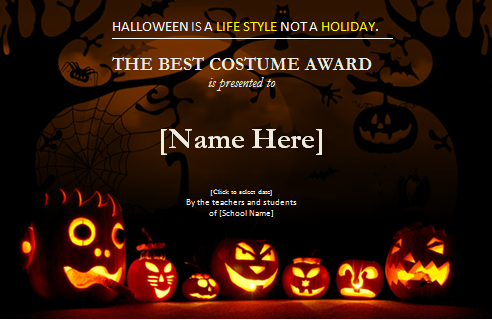 Halloween Best Costume Award Certificates can be given to those with the most unique and interesting costume. There are online templates available for such awards. Customize and print colorful and attractive certificates. These small tokens will be very memorable for kids. The certificates can have spooky pictures of bats, skeletons, and cunning pumpkin carvings. Likewise, colorful decorative elements can be added appropriately to the occasion. The main highlight of the certificate is the name of the winner. In addition, do not forget to add the date and year. In this way, winners will remember the exact year of their achievement. You can print as many certificates as you like. Every kid at your party should feel like a winner. Make different categories to award the participants. For instance, girls and boys can be awarded separately. Similarly, the certificates can also be given according to age. The main aim is to make your entire little guests feel special. Pay special attention towards how the certificates appear. Make them colorful and eye-catching instead of plain and unattractive. In this way, the winners would feel happier. For this reason, you should start planning and designing some time before your party. Take your time to customize the templates before printing. Keep them in a safe place until the fun day.